Until we address the conditions that give rise to extremism, the wars will keep going. 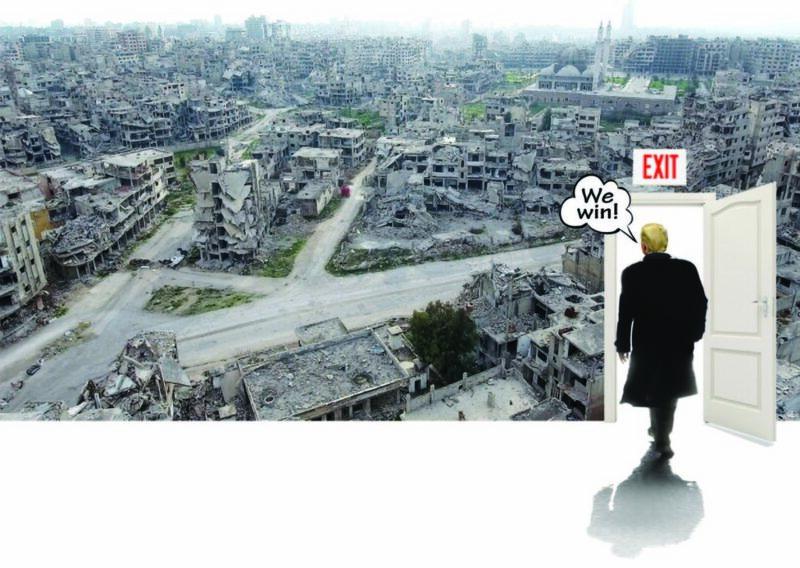 On Tuesday night, President Trump told the American people that the Islamic State has been defeated – that the only thing left is “remnants,” which our allies will destroy. That is less a statement of fact than an expression of his eagerness to go down in history as the president who ended America’s military involvement in the Middle East and Afghanistan. Perhaps Trump thinks these forays have been too expensive and futile, or perhaps, recognizing American fatigue with endless wars, he is simply playing politics ahead of the 2020 elections. Or maybe he thinks this is a war that the regional actors must fight, which would explain his readiness to accept Turkey’s promise that it will finish off the Islamic State in Syria. In any case, the real meaning of the claim that “we have liberated virtually all of that territory” is that Middle Eastern terrorism is no longer a casus belli for the United States. Vali Nasr, dean of the Johns Hopkins School of Advanced International Studies, was a senior adviser on Afghanistan and Pakistan at the State Department during the Obama administration. He wrote this for The Washington Post. It’s a hell of a gamble. It’s true that the Islamic State has been expelled from much of the terrain it held in Iraq and Syria. Gone is the caliphate headquartered in Raqqa that Muslims from around the world trekked to Syria to join. But even so diminished, the group is still a potent terrorist organization. It is a germ suppressed by antibiotics – but still alive and ready to infect and kill, if the medicine is cut. In Iraq, the group no longer holds territory, but many of its fighters remain. Others have found their way to Afghanistan – the first wave of foreign fighters to arrive since al-Qaida lost its redoubt there – where their campaign of terrorism has encouraged the Taliban, too, to step up its attacks, lest they be overshadowed by this Middle East import. As a price for leaving Afghanistan, the Trump administration says the Taliban must finish off the Islamic State. But the Taliban is not the Turkish military, which is trying to fulfill the same role in Syria. The Taliban has a history of falling under the influence of Arab terrorists. Unfortunately, Trump’s foreign policy is not supporting his ambition of ridding America of military headaches in the region. He has not been interested in the problems that caused the rise of the Islamic State: broken states, ravaged by civil war, with no prospects for peace. The United States has washed its hands of a diplomatic solution to the Syrian war, is indifferent toward Iraq (the president recently said that U.S. interest in Iraq is simply to monitor Iran) and has been contributing to a civil war in Yemen that is devastating that country and turning it into a breeding ground for the next generation of the Islamic State. At this rate, a future administration may find that it has to send troops back to the Middle East to put out new fires of extremism and terrorism. To U.S. allies in the region, Trump’s strategy is thinly veiled cut and run, a rudderless approach that will only worsen the chaos that followed hastily conceived interventions. Announcements like the one in his State of the Union address do not shore up America’s sagging credibility with friends and foes across the Middle East and South Asia. They understand the threat the Islamic State, al-Qaida and their offshoots still pose, and they grasp that it could continue to ravage their region if the door to terrorism is not properly shut today. No presidential bravado can change this. In one way, Trump has been successful. During the presidencies of George W. Bush and Barack Obama, the memory of 9/11 was still fresh and voters saw terrorism as an existential threat. Obama wished to rid America of its wars against militant Islam, but domestic obsessions (stoked by pundits, the press and politicians who are now arrayed behind Trump) prevented it. Trump has punctured this overinflated American obsession, turning our national focus elsewhere and allowing him to declare that he quashed the Islamic State, regardless of whether it is true. Americans these days are more worried about the fate of their democracy, the extent of Russian interference in their politics and institutions, and the looming Chinese threat to their global dominance. The Pentagon’s new National Defense Strategy, unveiled last year, identified Russia and China, not the Islamic State, as the primary strategic threats in the years to come. Washington’s focus is shifting to great-power politics. Even Hollywood doesn’t find terrorism as compelling anymore. This all affords Trump with political space to extricate U.S. forces from the Middle East and Afghanistan. But let us not kid ourselves: This is not a victory on the battlefield. This is a triumph at the home front – one that would not have been possible without Americans seeing the chaos of a Trump presidency as a greater threat than terrorism. That is the victory that Trump can rightly claim.